What just happened? The Polaris architecture sees a new refresh, a shrink, and a double-digit performance boost that Powercolor claims will put it over the competition. 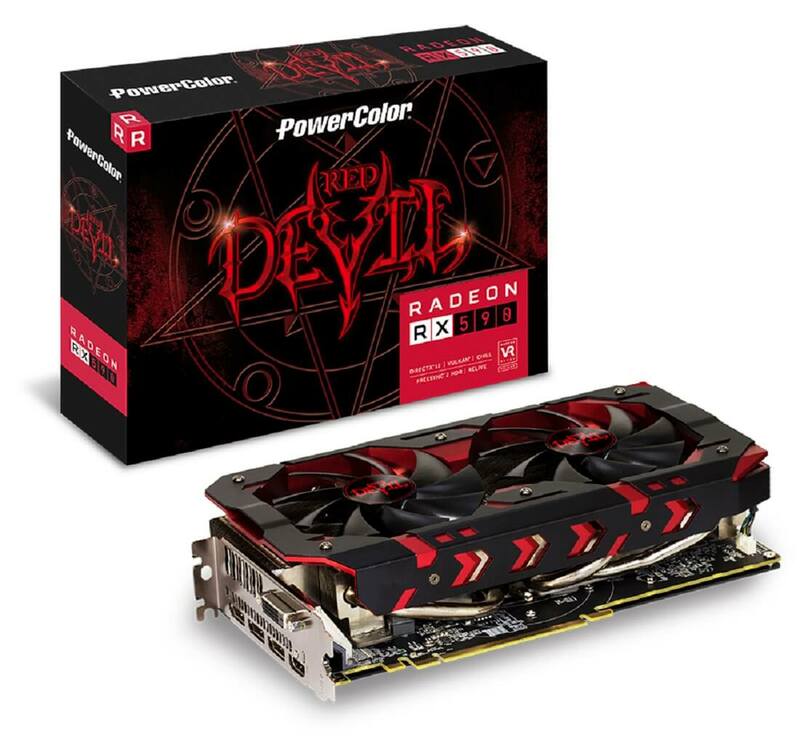 Powercolor, the long-time Taiwan-based AMD partner, has published details of its upcoming Powercolor 'Red Devil' RX 590 graphics card, materializing the rumored 12nm Polaris shrink, a.k.a. Polaris 30. While you might ask whether it is worth a look, Powercolor is saying its the best in its price category. The RX 590 refreshes the RX 580 line (which, itself was a refresh of the original Polaris), with a shrunken die, now fabbed at 12nm, and higher clock rates, which Powercolor claims will bring a 10% performance edge over "comparable priced cards," its most likely target being the Nvidia GTX 1060 6GB. Looking under the hood, you quickly realize that very little is going on in terms of innovation: its technical specifications are identical to the brand's Red Devil RX 580 Golden Sample, except the clock boost of 1576MHz (1425MHz on its predecessor), which AMD squeezed out of the new process. This raises FP32 performance to -- we estimate -- 7.26 TFlops, up from 6.17 TFlops on the RX 580, at peak performance. The card keeps with the 2304 stream processors on the GPU, backed by 8GB of GDDR5 memory running on a 256-bit memory bus and 8+6 pin PCIe power connectors. The PCB also features a 6+1 power phase design for "better stability and efficiency", and multiple heat pipes for heat dissipation. Polaris has always been a power hungry chip and it seems the 12nm process hasn't brought much in the way of power savings. Physically, nothing much has changed as it is a clone of the Red Devil RX 580 Golden Sample edition. Its tell-tale dual-fan design stacks 3 slots high, so you'll need to be careful you don't block other cards in your system if you plan on an upgrade. The card also includes a number of convenient features such as Mute Fan technology (which stops the fans whenever the temps go below 50º Celsius), as well as preset BIOS modes for silent or performance modes. The RX 590 also keeps with DirectX 12, Vulkan, Freesync 2 HDR and ReLive support. Powercolor seems to have jumped the gun with this launch as it is dated November 15th and has since been pulled... but the Internet remembers. Powercolor's reported $279 price tag is considered hefty for such a card, but this includes three game titles: Resident Evil 2, Devil May Cry 5 and The Division 2 (which the company claims to be worth $180). All things considered, AMD and Powercolor are raising the ante and adding competition to the mid-range segment which has been stagnant for too long. Hey, with any luck, a reaction from Nvidia might yield some reworked GTX 1060s or, who knows, price cuts on its GTX 1070s.